The Brick Castle: Be A Knight - Do It Right! 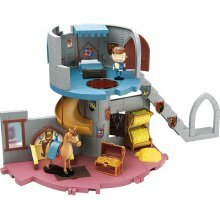 This playset features Mike The Knight's castle home in the Kingdom of Glendragon and comes complete with Mike and his horse Galahad, a treasure chest and plenty of straw. It has a secret slide under Mike's bed which transports Mike straight downstairs to Galahad and a hidden compartment in the floor where Mike can store his treasure. Mike is very rubbery and bendy and we liked that because we think he will last a lot longer than if he was made of stiff plastic! My 2 youngest boys really enjoy playing with this set and it is brilliant for telling stories, comprehension and make believe. They really enjoy small world play and we found that this set was a perfect size for playing along with Playmobil, Fisher Price and other characters and accessories that we already had. We were also lucky in that Santa Claus thought it was a good idea this Christmas to bring a couple of the add-on playsets which are also available to extend play and introduce other characters from the BBC childrens' programme. Overall this playset has given them hours of fun, and the additional sets make it great for more than one child to play together. The RRP of £29.99 is high, but the additional sets are far less expensive and make a really large toy. We were lucky enough to be sent this toy to review, but the opinions and reviews are our own genuine thoughts.